What is MRSA? Methicillin Resistant Staphylococcus aureus, or MRSA, is a mutant strain of the common bacteria Staphylococcus aureus (staph) infecting our Hospitals, Schools, Sporting Facilities, Locker Rooms, Institutional Facilities, etc.. Staph is ordinarily found in the noses and on the skin of normal healthy people, and generally poses no risk to the person. MRSA is resistant to the standard hospital antibiotic, methicillin. Common pathogenic (disease causing) bacteria are mutating, producing new mutant strains which cannot be treated with standard antibiotics. 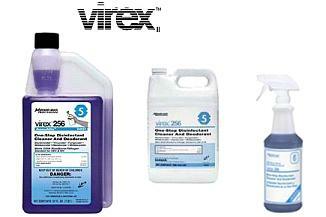 OxivirTb is a fast acting one-step Ready-To-Use cleaner that disinfectants hard, non-porous inanimate surfaces. Take action now to protect your SCHOOL, HOSPITAL, FITNESS CLUB, LOCKER ROOM, INSTITUTIONAL & GOVERNMENTAL FACILITIES. 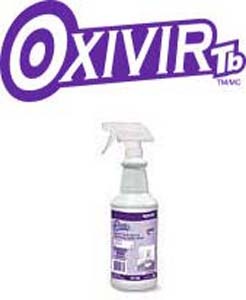 OxivirTb is a general Virucide, Batericide, Tuberculocide, Fungicide, Sanitizer One-step cleaner disinfectant spray formulated with patented Hydrogen Peroxide technology to deliver faster, more effective cleaning performance. EPA registered formula that KILLS MRSA!